Premium Japanese Synthetic Material – Great Feel, Flexibility, and Increased Durability. 4-way Stretch Synthetic on Knuckles – Advanced Performance: Moisture-wicking, Breathability, and Flexibility. 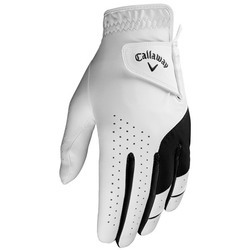 Perforations on Palm, Top of Hand, and Fingers – Moisture Reduction and Increased Breathability. Reinforced Palm Patches – Improved Grip and Durability in All Weather Conditions. Opti Fit™ Adjustable Closure – Thin, Light, and Secure Fit. Stretch Binding Cuff – Secure Feel and Moisture Absorption. Item number listed is for Men's Regular Left Hand Small. 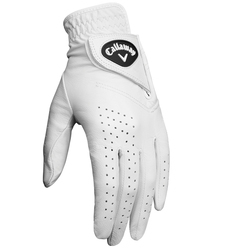 The Callaway Women's Dawn Patrol showcases the ultimate in performance and durability in an all leather glove. All Leather Constructions: Great Feel, Fit & Durability. 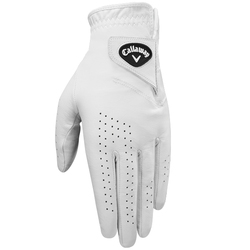 Perforations on Palm, Fingers and Thumb: Moisture Reduction & Increased Breathability. Opti Fit™ Adjustable Closure: Thin, Light & Secure Fit. Cotton Terry Cuff: Soft Feel and Moisture Absorption. 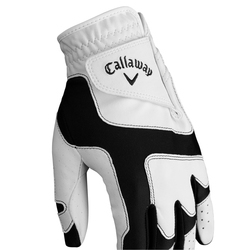 The Callaway Dawn Patrol showcases the ultimate in performance and durability in an all leather glove. All Leather Constructions: Great Feel, Fit & Durability. 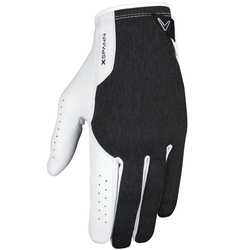 Perforations on Palm, Fingers and Thumb: Moisture Reduction & Increased Breathability. Opti Fit™ Adjustable Closure: Thin, Light & Secure Fit. Cotton Terry Cuff: Soft Feel and Moisture Absorption. One Size Fits Most: Small — XL. Seamless Technology – Bonded Synthetic for a Seamless Feel. Premium Japanese Synthetic Material – Great Feel, Flexibility, and Increased Durability. 4-way Stretch Synthetic on Stretch Points – Advanced Performance: Moisture-wicking, Breathability, and Flexibility. Opti Fit™ Adjustable Closure – Thin, Light and Secure Fit. Stretch Binding Cuff – Secure Feel and Moisture Absorption. 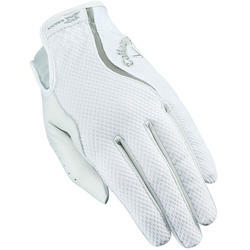 The X Spann Golf Glove comes in a lightweight design with soft feel and full control. Pull tab-less design. 3D Performance Mesh: New compression system provides perfect fit. Moisture wicking and breathable. Lightweight and flexible. Full Palm Cabretta Leather: Thin and soft Cabretta leather delivers seamless feel. Chev Tension Sensors: Silicon Chevrons on microfiber suede provide additional grip and club control.